This isn’t a definitive guide as to the places to eat in Reykjavik, Iceland, but rather a review of the places I ate at during my recent stop. Casual, high end, authentic, and greasy are all easily found in Reykjavik and covered here. Once you find a favorite restaurant, make sure you check out the foods unique to Iceland that you MUST try. 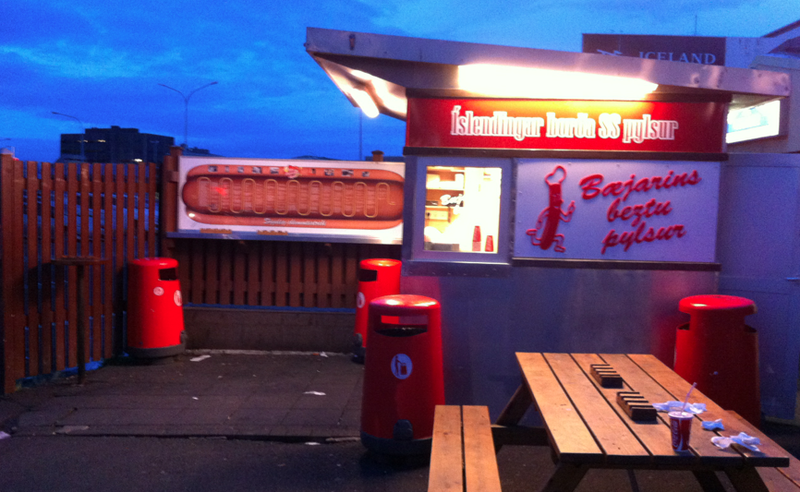 I was excited to try this legendary hot dog stand on Reykjavik’s waterfront. Recently having celebrated it’s 70th anniversary, Bæjarins Beztu Pylsur (translated as “the best hot dogs in town”) is widely accepted as the most popular restaurant in Iceland. Their dogs were recently hailed by The Guardian as the best in all of Europe. There’s almost always a line, and the staff will be surly. 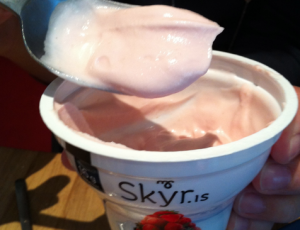 Just go up, hand over your 320kr and ask for one with the works – everyone does. People watching is the order of the day alongside Reykjavik’s cafes. Cafe Paris is in the middle of a block of cafes sharing space on the back side of Austraestdi near the city’s main square. Sharpen your elbows and pounce on a place as soon as you see one open. This wasn’t the place to order Icelandic lobster and a lamb steak, but that’s what we had. It was an average food experience to say the best, and the range of beers at Cafe Paris is slim (head down the block to Micro Bar in the City Center Hotel if you’d like some local microbrews), but it’s the location that makes this place pop. It’s a laundromat that packs in the hipsters to sip beers and snack while they wait for the spin cycle to finish. Upstairs is a very cool diner, restaurant, bar. They open early in the morning for breakfast, and don’t close until early in the morning. There’s always a line of people getting in, and I wasn’t kidding about the laundry. It’s in the basement, so if you need to freshen up your clothes while on vacation, drop them off downstairs, head upstairs for some beers and conversation, and then back down to fold. Wow. What a beautiful room with an intriguing local menu to boot. Head Chef Guðlaugur Frímannsson is committed to serving what the land offers. He has partnerships with local farmers to buy his products, and then crafts the menu accordingly. Our meal included a trio of mini burgers (whale, puffin, lobster), the fish trio (salmon, salted cod, monkfish), as well as a beef rib steak. 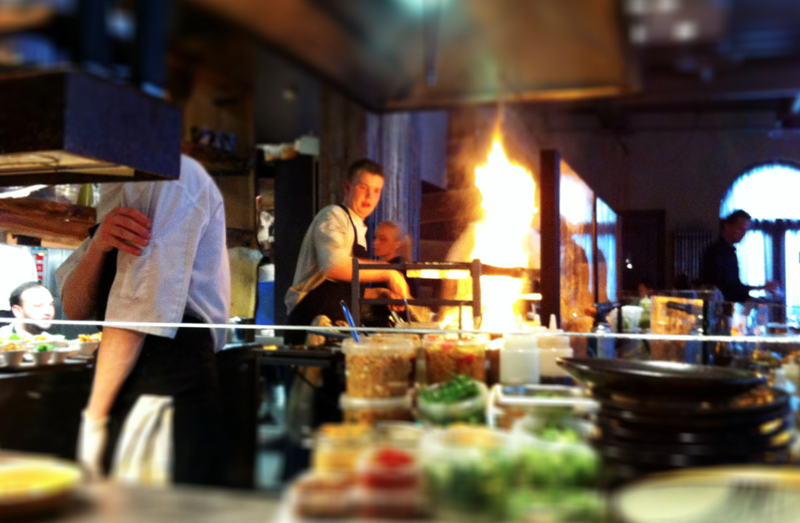 All the food was delicious, the service was spectacular, and our bench at the grill were a ringside seat to the action. For dessert we had the Grill Market Chocolate. It was a beautiful chocolate ball that melted to reveal a scoop of ice cream when the accompanying warm caramel sauce was poured. Genius. The decor of the room matches the authenticity of the menu with raw wood beams exposed along the wall and a wallpaper of spotted catfish skins. Downstairs, tree trucks are aligned to section off long tables into private rooms as if you were eating in your own forest. Make sure you check out the gorgeous bathrooms where you wash your hands in a waterfall. 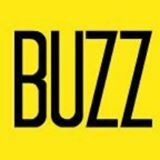 THAT’S WHERE TO EAT IN ICELAND, NOW READ WHAT TO EAT IN ICELAND AND LEARN ABOUT PUTRIFIED SHARK!